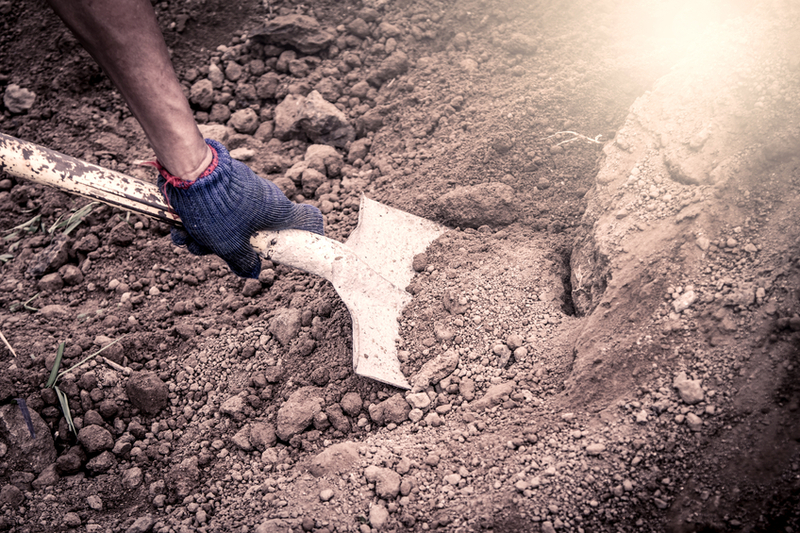 To dig means ‘to turn over earth with a shovel or a spade’ or ‘to work very hard as if turning something.’ Dig also means ‘to poke or force.’ As a noun, a dig is a poke and also an archeological excavation site. Informally, a dig is a sarcastic remark. Dig has another slang meaning. As a verb, it is used informally to mean ‘understand’ or ‘take notice of something’, and also, very informally ‘to like.’ These slang meanings can sound dated in some circles, but some people still use them. Janine spent all day digging in the garden. The rider dug his heels into the horse's sides. Linda gave me a dig in the ribs to warn me to be quiet. The archeologists are working on a dig about a mile away. I don't like that guy; he's always making digs about the way I look. Dig that hat! It's so colorful! I really dig the Beatles. When the singer says “dig a little deeper” in the chorus, she doesn’t mean physically. She means to think harder, to find out who you are and what you want, so you’d be figuratively digging inside yourself for the truth. Did you like the style of the song? That’s gospel, which is a popular style of religious song in the US, in particular in African American churches. Dig dates back to the late 13th or early 14th century. The Middle English verb diggen means ‘to dig.’ It may have come from a lost Old English verb form of the noun dīc (ditch), or from the Middle French verb diguer, meaning ‘to dig’ (some linguists think the Middle French verb came from a different Germanic verb, maybe from Middle Dutch). The noun came about much later, in the late 17th century (meaning ‘a tool for digging’), and in the late 19th century, the meaning of ‘an archeological site’ appeared. To dig, meaning ‘to poke with an elbow,’ dates back to the early 19th century, and the related figurative sense, of poking someone with words, is from the mid-19th century.